The sporty image of the Mercedes-Benz S-Class is manifested in its athletic “physique”. Minus 2 doors, the dynamic shape of the windows, narrow headlights, understated ground clearance , clear lines of the body – this is the image of the Mercedes-Benz S Coupe. 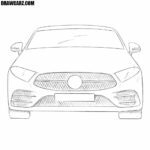 And today, DrawCarz.com decided to show how to draw a Mercedes-Benz S Coupe. So, using rough and light lines we depicture the contours of the S Coupe. Here we see a long and flat rectangle and a slightly curved line, which later turns into a roof. 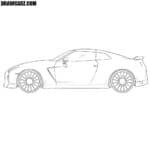 Now we need to design the most basic details to the body of S Coupe. Sketch the headlights, windows, mirrors and wheels. As in the previous step, the very light lines are also used here. Starting with the third step you need to be more attentive. Accurately trace the outlines of the headlight and the hood of the S Coupe. In the same step, we need to depicture the bumper lines and the air intake. So, proceed to the roof on our Mercedes-Benz S Coupe. Now design the the low roof. Also depicture the windows and mirrors of our luxury coupe car. Now, depicture the roof line that smoothly moves into the shape of the back of our Mercedes. Carefully design the line of the trunk and rear light. As parts are drawn, delete unwanted lines. Now carefully depict the lower edge of the S Coupe. Next, draw out the long door, handle and decorative lines on the side of the body of our this coupe car. 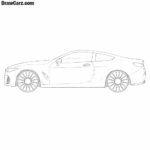 Now draw out the tires and rims of the Mercedes-Benz S Coupe. You can make perfectly round tyres with a compass, or try to make them manually. In the same seventh step, draw out the rims. Now it’s time for the shadows. Use simple hatching to depicture the shadows, as shown in the example of DrawCarz.com. Do not forget about the glare on the windows and the body of S Coupe. 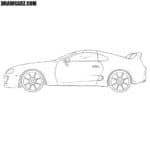 The team of DrawCarz.com today showed you a tutorial about how to draw a Mercedes-Benz S Coupe. 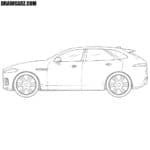 Features of this body are low and sloping roof, the presence of two doors without frames. Also, often cars in this type of body have larger wheels and low-profile wheels. That is, these cars have a more sporty look than regular sedans or hatchbacks. 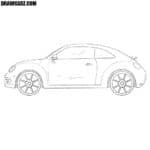 By the way, in one of the previous lessons we showed how to draw a coupe car. 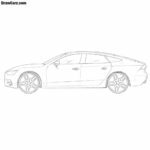 In this lesson we showed the basic principles of drawing cars in this type of body. Designers and engineers of the highest level participated in the creation of this luxury coupe car. We really want our readers to be able to draw no worse than the coolest designers of the Mercedes-Benz brand. 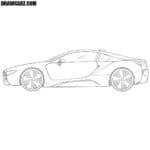 There is still a lot of interesting things ahead, so do not forget to visit DrawCarz.com as often as possible.